For better or worse the traditional April 1st fishing opener has come and gone without much fanfare here at High Country Flies. Not so many years ago the local fishing community fervently awaited April 1. Now with virtually year round fishing on the Upper Snake the excitement has diminished for the Cowboy State’s General Fishing Season Opener. Just another sign on how the face of fly fishing is changing. Fly fishing has become noisy. It is taking on the look of the Bassmasters or NASCAR, with tournaments, self promoting Hey, look at mevideos; you can’t catch a fish unless the fly is made of soulless foam and rubberlegs. Whatever happened to just the water, the fish and one’s self? Sorry, this is supposed to be a fishing report not a pulpit. Maybe I just needed to get the winter cobwebs out?? In early March we had warm weather and fishing on the Snake had picked up considerably. Lately we have been experiencing repeated snow storms resulting in inconsistent fishing. The good news is this usually is a great set up for the Spring Skwalla Stonefly hatch. Springs that start with warm weather, then a cold snap, followed again by warm weather, are generally just the ticket for a good Snake River Skwalla hatch. So theoretically, the next fixed warm spell should really make them pop. Again, this is in theory, we will see how it plays out. In the meantime, for dry fly action, it is Midges and our little black Stoneflies (Capnia) that will be of importance. As far as we know, there are no commercial patterns tied for the little black Stones, but small dark Caddis and some black Midge imitations can cross over and work quite nicely for this interesting little Plecoptera. With the Midges, look for reproductions tied in colors of black and gray, or with peacock herl. Red is also a midge color that should never be overlooked. For the individual style flies, try sizes 18 through 24. For the cluster style Midge Patterns (Griffith’s Gnat or version’s of) you may be able to get by with 16’s, but 18’s and 20’s will be the norm. Even though the dry-fly Skwalla fishing hasn’t really started yet, the nymph of this insect will be very active. So, imitations of Golden Stone nymphs in size 8 and 10’s can be very effective. A plain old Hare’s Ear, Red Fox Squirrels, Golden Epoxyback, and Tungstone are all applicable. A two nymph system, one stone nymph and one midge imitation, can be a great searching technique. For dries, many patterns can work, from Stimulators to Parachute Hoppers, but we think you will find low-profile patterns like the Bullethead Skwalla and Brukholder’s Skwalla will be most effective once the adults are on the water. For general Nymphing don’t over think it. Your favorite underwater pattern in the early season can always be productive. Your pet creations in 14’s and 16’s should work fine. Of course Midge larva and pupae imitations will also work but many times you won’t necessarily need to fish that precise or small of patterns. More times than not, fishing the right water can be far more important. As many resident Chuck Duckers already know, early season Streamer fishing can be deadly, and every spring we see quite an array of new streamer prototypes that locals have developed over the winter. Many years, one of these new designs can become a hot fly. Sometimes it turns out to be the fly for the season, and now and then it will become a fly box standard. Most of us have our favorite streamer or streamers and most springs they all work to varying degrees…take this as you will…don’t overlook light grays, tans, and white. After talking to many spring Strip and Rip fishermen, the pattern didn’t seem to be as important as the color. The release from Jackson Lake dam is 477cfs (as it has been all winter), and Jackson Lake is 77% full, Palisades Reservoir 76%, and American Falls Reservoir 97% full. We would have to go some to have a better fishing season than 2008, but with a snowpack water equivalent of 103% and the Minidoka reservoir system in the best shape we’ve seen in years, we are online for 2009 to also be a great one. Unless we experience some kind of freakish weather event in April or May, water flows shouldn’t be an issue this season. At the very least one would think the Bureau of Reclamation will have a lot of flexibility with water releases. 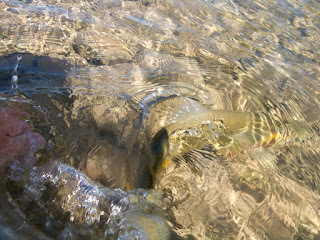 If you are planning a trip this summer to Jackson Hole, we are expecting a traditional run-off season. Area tributaries should start fishing by early July and the Snake River itself fishing with good consistency by late July or early August. High Country Flies asks all those fishing in the early season to be especially sensitive of the fish. Remember, most of the Snake River Cutthroats have not yet spawned. Possibly, if a fish is aggressive enough to take your fly (be it dry, nymph, or streamer) in early season conditions, it just may be the gene pool we want to procreate. Please take into consideration how long you play a fish and how it is released. At times you may need to break a fish off or cut your fly or take whatever means is necessary for its survival. You will always have another day to fish, the fish may not have that luxury. If there is ever a question of this extraordinary creature’s survival, let the fish win. Come on ma. Where's the high pressure?